Discover #1 New York Times-bestselling Patrick Rothfuss' epic fantasy universe of The Kingkiller Chronicle, in this illustrated companion novella, The Slow Regard of Silent Things. "I just love the world of Patrick Rothfuss." --Lin-Manuel Miranda - "He's bloody good, this Rothfuss guy." 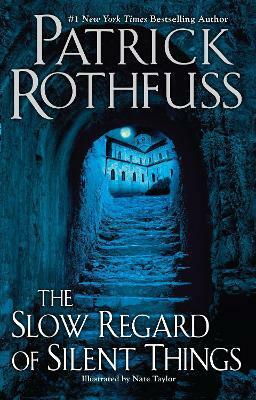 --George R. R. Martin - "Rothfuss has real talent." --Terry Brooks Deep below the University, there is a dark place. Few people know of it: a broken web of ancient passageways and abandoned rooms. A young woman lives there, tucked among the sprawling tunnels of the Underthing, snug in the heart of this forgotten place. Her name is Auri, and she is full of mysteries. The Slow Regard of Silent Things is a brief, bittersweet glimpse of Auri's life, a small adventure all her own. At once joyous and haunting, this story offers a chance to see the world through Aurir's eyes. And it gives the reader a chance to learn things that only Auri knows.... In this book, Patrick Rothfuss brings us into the world of one of The Kingkiller Chronicle's most enigmatic characters. Full of secrets and mysteries, The Slow Regard of Silent Things is the story of a broken girl trying to live in a broken world.